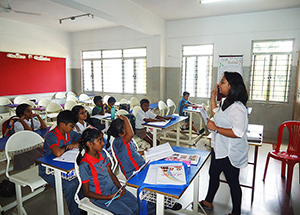 At CMRNPS after-school activities are conducted so that the students can nurture their inborn talents under the able guidance of professionals and trained teachers. 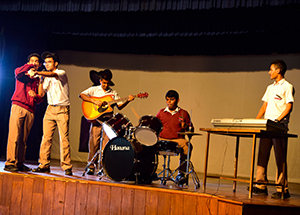 We believe that academic excellence and co-curricular activities always go hand-in-hand and provide students with a plethora of activities to choose from. 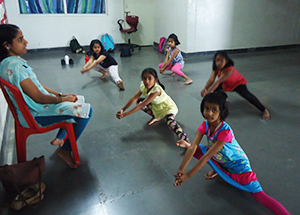 The after-school activities provide further avenues to enable the students to enhance their artistic skills. These activities give students a chance to spend quality time in a relaxed environment and learn new skills of their interest. These activities help in personality development, improve kinaesthetic and psycho-motor skills, build self-confidence and bring about holistic development of every student. Basketball is one of the world’s most popular and widely viewed sports. Basketball is a very entertaining sport and is known as a fun pastime with friends. 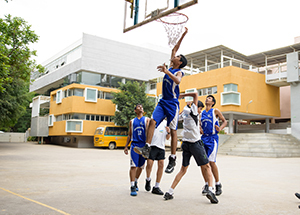 Basketball is a great way of exercise and a great way to learn while having fun with friends. Through this fast-paced and competitive team sport, we hope to inculcate vital life lessons to our students. It is a team sport that allows students to learn life skills with a positive attitude, an important process that students have to learn as they are bound to face challenges in their lives. Students will realise that success can only be achieved through endurance, perseverance, hard work and discipline through this game. Playing a musical instrument is a great activity as it is a perfect way to relax. Music is a protean art that permeates every human society. Music is the art of combining vocal or instrumental sounds, for beauty of form or emotional expression. At CMRNPS, we provide classes on musical instruments including Drums, Guitar and Keyboard. Musical experiences in childhood can actually accelerate brain development, particularly in the areas of language acquisition and reading skills. Exposing children to music during early development helps them learn the sounds and meanings of words and helps the body and the mind work together. It always has seven different pitches (called swara) and is a basis for the organization and classification of ragas in North Indian classical music. Each one of the several traditional ragas is based on, or is a variation of, ten basic that, or musical scales or frameworks. 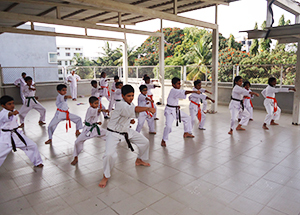 Karate is a system of self-development using kicks and punches. Its quick, sharp actions involve snapping movements of the joints which helps students to learn self-defence and improve their fitness. We here at CMRNPS are focused on self-defence & the non-violent philosophies behind it. This helps kids to be confident, aware, focused and learn to respect themselves and others. Bharatanatyam is a variety of natya yoga that reveals the spiritual through the physical and emotional body. It is the most popular of the Indian classical dance forms in South India and the most ancient of all the classical Indian dance styles. Roller skating is the perfect way to combine fitness with fun. It helps people develop a fitness habit with a sport that’s enjoyable for all ages. 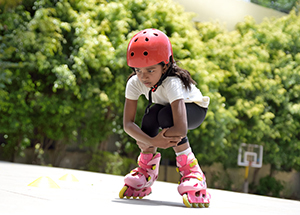 Roller skating helps students to increase muscular strength, improve balance, agility, coordination and flexibility, controls weight and is a great tension-reliever and enthusiasm-builder. Robotics is one of the fastest growing industries in recent times which deals with the design, construction, operation, and application of robots. 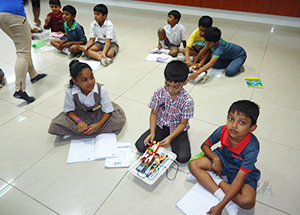 Robotics classes will help the students to know about the emerging technologies and provide hands on experience by application of these technologies for building robots. ART is a mode of creative expression. Painting is one of the form of art. It helps the students to express their unique responses to art. This supports children’s large and small muscle development, as well as their eye-hand coordination. t can be a great podium for children to progress and discover their creativity. Pencil Sketching is another form of art which is a rapidly executed freehand. The sport of volleyball is physically demanding, and requires a combination of endurance, muscular strength and power. Improving on these 3 aspects can help greatly enhance the physical well-being of the individual, and help him or her grow up to be a strong, fit and healthy adult. Not only is this important physically, it’s also important for the mental and emotional being as well. Playing Throw ball on a regular basis is one way to increase one’s physical activity level, which will help to get fit and toned, as well as healthy and energetic. It enhances the energy level and improves the overall performance in other sports and workouts. Due to its quick changes of pace and direction, throw ball places a large number of demands on the technical and physical skills of a player. Chess is believed to have originated in India sometime before the 7th century. Often known as a game for the intellectually gifted, chess is the best sport to exercise the most important organ in our bodies: the brain. Playing chess increases the performance in reading. Playing table tennis is a great way to stimulate the brain and promote quick thinking while improving hand-eye coordination. It happens to be the world’s best brain sport. Table tennis works parts of the brain that are responsible for movement, fine motor skills and strategy – areas that could be growing stronger each time. The repetitive and multidirectional movements promote your child’s agility and flexibility. Badminton is a game which can be easily played by people of any age group without much difficulty. Badminton helps to overcome fewer symptoms of anxiety and depression. It is a game which will not only groom physical health but will help improve mental health as well. When children play this game, it improves their concentration and this in turn helps them to be more focused, alert and agile. CMR plans outbound programmes that include picnics, field trips and educational tours within the school schedule. These programmes expose students to a hands-on learning experience, all doing so while having fun. These trips also allow students to apply their lessons to real life experiences. As part of the 2014 educational tour, students of CMRNPS visited the Kennedy Space Centre where they got a chance to explore and interact through space shuttle mission simulations. They attended a workshop at Broadway Theatre and also visited Massachusetts University and Harvard University. In 2015, students went on a 3-day trip to Hampi to learn about the history and archaeological significance of the place through activities like interacting with experts and mock excavations. Students have also visited the Britannia Biscuit factory, the Janapada Loka, the HAL Museum, the Ranganathittu Bird Sanctuary, the Visvesvarya Museum, the Indian Institute of Horticultural Research, the Indian Institute of Astrophysics, the Venkatappa Art Gallery, and Bangalore Dairy as part of the frequently conducted field trips.